I admit it. I’m not a fan of any of Laika’s previous films, unlike most other animation fans (and the Motion Picture Academy apparently, which has given a Best Animated Feature Oscar nomination to all three of their past movies). I’m mentioned some of the reasons why in an earlier review. But after seeing ads for their latest offering I held out hope that this one might be different from what was becoming their pattern. It appeared to have less of a focus on the macabre and more of an emphasis on the fantastical. It looked actually gorgeous as opposed to being gorgeously ugly. And it seemed to have an interesting protagonist. I wasn’t convinced but was hopeful Laika could finally win over a stop-motion curmudgeon like me. Kubo lives outside a Japanese village in a cave with his mother. During the day she sits quietly unresponsive to all stimuli, while Kubo makes money in the village by using his magic three-stringed shamisen to make paper come to life as he tells stories. Kubo has to be home by nightfall, as he and his mother are being hunted by her estranged family. One day as he is trying to learn more about his long dead father Kubo loses track of time, is found by his pursuers, and must begin an adventure worthy of one his own stories to save himself and those he loves. 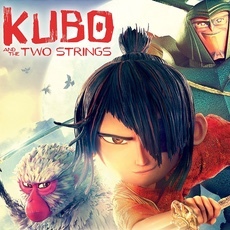 Plot-wise, Kubo and the Two Strings gets a lot of credit for originality. Which is a good thing in a story about storytelling! 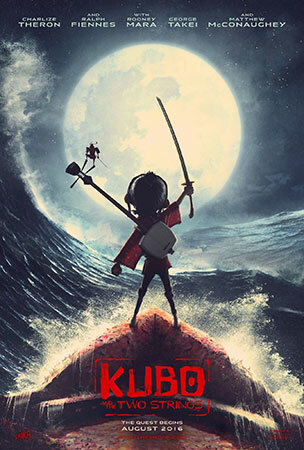 Kubo is unique, full of surprises, and infused with sincere emotions. Don’t go in expecting the usual joke-a-minute routine animation studios usually try to give us. Kubo is less concerned with tickling your funny bone and more worried about stimulating your mind and touching your heart. Besides making you care about and understand the motivations of the characters, the writers move the audience by twisting their expectations. I’m not just talking about basic blot twists — which Kubo does have too — but subverting the way we expect life to play out in typical animated movies. Your kids probably aren’t used to a story like this. That said, I did have a few issues that took away from the overall feel. The whole animated-episodic-journey-movie is getting a little overused for my tastes these days. Also, the writers have a tendency to gloss over or just forget about important details. (Mild spoiler-y case in point: “let’s go on an epic journey to find these three legendary pieces of armor and then have them play no role in the outcome of the film!”) Lastly, the end of the film was a little too simplistic and superficial, especially considering some of the more bold choices the filmmakers made at other points in the story. The animation in Kubo is stunningly beautiful in design. While the stop motion itself didn’t feel as fluid as in Laika’s previous outings, that may have been down to how aggressively they seemed to be trying to push the boundaries of the medium. The origami concept is fun and novel and opens up new ways to show and tell a story. While the character designs were overall great, I wasn’t a big fan of two of the main characters: Monkey and Beetle. I can’t put a finger on what I didn’t like about Monkey. Beetle’s face seemed two-dimensional and grated on me throughout! Dario Marianelli’s score is fitting and evocative without being overpowering or too exotic. If anything, it could have stood to stand out a little more among the gorgeous visuals. From a performance standpoint, the voice acting in Kubo was very good. All the characters do a convincing job of portraying the emotions and actions of their parts. However, once again, Beetle slightly annoyed me! Matthew McConaughey does a good job acting, but his vocal choices grated me occasionally. But Art Parkinson is amazing as Kubo, Charlize Theron does a fine job with her role, and Rooney Mara is appropriately menacing as Kubo’s aunts. 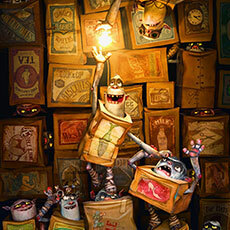 Stop motion movies usually fall flat for me for various reasons. I can count on one hand the number I’ve really enjoyed in the past 20 years. This film is on that list. Part of the reason is that it is so unique and unconventional: full of heart but not necessarily heartwarming, fun but not necessarily funny, surreal but more real than most animated films. 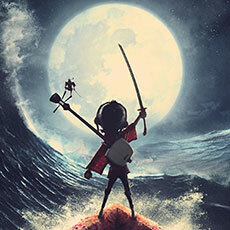 Kubo and the Two Strings is magical storytelling.